Greetings Fellow Wisconsinites! Welcome to the 2018 Election Season! Like it or not, the 2018 Election Season is now hard upon us. The time has come once again for Wisconsin patriots to examine the candidates for political office in view of the many tremendously important political matters now before us, matters of both political policy and of political ideology. Between now and November 6, 2018, we will all be awash in the messaging of professional politicians and interest groups advocating their positions and candidates. This is as it must be. It is the American way, after all, both a privilege and duty of citizenship in this Great Experiment of self-government. 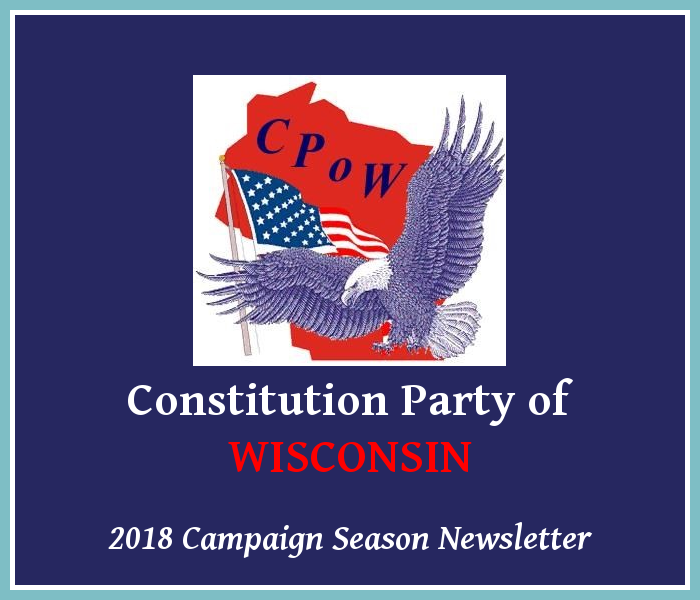 The Constitution Party of Wisconsin gladly adds its voice to this chorus, and in the process, we hope, will render the others a mere cacophony! And we have good reason to join the chorus. We advocate what was once the predominant, and is still the correct, understanding of the United States of America as a constitutional republic that is founded on Liberty of Conscience, Security of Property, and the Rule of Law as inviolable principles of social order. To maintain ourselves as a truly free nation, such principles have necessarily been guided by an understanding of human nature informed by biblical teaching, and thus also by a general observation of Christian morality in both our social customs and our laws. Sadly, this understanding has been cast into the memory hole by the enemies of Christ and of Western Civilization, and is fast on its way to becoming a forgotten artifact of American antiquity. Our Nation, our State, our society have lost their way. Though rightly full of concern and motivated to action, we happy few, we members of the Constitution Party of Wisconsin and other like-minded folks across the State and Nation, are not deluded into thinking that we are the solution to the woes of our State and Nation; rather, we understand all too well that a True and lasting Solution is wrought only by the Hand of Providence. We are confident that He is at work even now – hence our bold and fervent prayers for divine influence and intervention. Nevertheless, convinced as a matter of Christian conscience that we are His instruments for good in an otherwise directionless and lost society, we also humbly place ourselves on the public stage (in full realization of our personal unworthiness), and reluctantly place ourselves in harm’s way (literally, as engaging in bona fide political speech places Christians in imminent danger of losing their livelihoods and homes these days), that we may be of service to our fellow Wisconsinites by giving voice to our collective convictions – as their neighbors and peers in the public square and as their representatives in elected office – and in this way by acting as a catalyst for positive change that is consistent with a much needed return of a genuinely fiscal, social, and Constitutionally conservative body politic, that brings us once again into harmony with the form, purpose and function of government instituted by God in our State and Nation. This post is the first in a series of weekly Communiqués that will (Lord willing) extend through the Election Season of 2018. These may be interspersed with shorter blog posts like Press Releases and messages from our three major Campaigns. We not only invite, but also strongly urge you to share these blog posts with all of your friends, family, acquaintances, or others who share our political convictions, or who otherwise share a genuine and open willingness to hear and consider the political views of others. This post was delivered to our email subscribers on Sunday, September 9. Click here to be added to our email subscription list, and to receive our Communiqués when they are hot off the press! And that therefore, it is essential to bind government with the chains of the Constitution. Religious Freedom: we demand an end to government attacks on religion, and instead call for the protection of religious freedom in not just the Sunday worship of America’s Christians, but in all of their Christian thinking, speaking and doing throughout their daily activities, whether at work, at home, or in the community – whether that community is in the physical world of real people, or in the virtual world of online social media from which many are increasingly deriving their sense of community. State Sovereignty: only a few enumerated powers are delegated to the Federal Government by the U.S. Constitution, with all remaining powers being reserved to the States and the People; thus we call for the State of Wisconsin to reassert its sovereignty, and thus move the Federal Government to divest itself of operations in our State that are not authorized by the Constitution. While these views may be enough to distinguish us from other so-called “conservative” political parties, it should be stressed that in addition to holding these political convictions, we are also committed, as a Party, to acting on these political convictions – something which other political parties have either declared or demonstrated themselves loath to do. This has become a primary reason that many of us have finally decided to join the Constitution Party of Wisconsin. Dear Wisconsin Patriots, the 2018 Election Season has begun! Over the next few days, you can expect to hear directly from our candidates on the issues in this forum. Look for them on the internet! Look for their events in your area! If you feel so inclined, please don’t hesitate to contact the Constitution Party of Wisconsin, or the Campaigns to volunteer or donate. Above all, pray for our Republic and our State, for representatives in government, and pray for our Society. If you resonate with our political message, we, again, not only invite, but also strongly urge you to share our message with all of your friends, family, acquaintances, or others who share our political convictions, or who otherwise share a genuine and open willingness to hear and consider the political views of others. Note: We are a small political party, and rely on donations from members and like-minded conservatives for our survival. Please CLICK HERE to DONATE, today. Thank You! Copyright ©2018, Constitution Party of Wisconsin, All rights reserved. whom should I vote for governor in the upcoming election. I supported Darrell Castle In the last presidential election.